Martin and Chris are on a mission in the Arctic to discover just how animals move around in different environments. Their new knowledge of both buoyancy and traction comes in handy when they discover that the dastardly Zach Varmitech has kidnapped a Walrus calf and a Polar bear cub. The Wild Kratts team will do whatever it takes to return the baby animals to their mothers! Chris and Martin are out to investigate why the walrus looks so weird, but then find out that Zach Varmitech has kidnapped an entire herd to mine precious pearls for Donita Donata’s fashion line. The Wild Kratts team figures out that walrus’ have incredible powers that have a lot to do with how they look. They must employ the walrus’ super suction and other amazing powers against Zach to save the herd and return them back home to their Arctic domain. 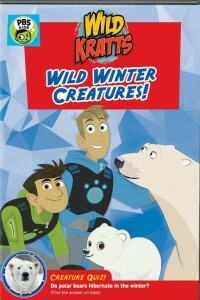 When Chris realizes that his precious Creature souvenir collection is missing, the gang must travel back to the Arctic to find it. But the Arctic is now covered in a thick layer of ice and snow, so they’ll need the help of a special Arctic creature – the Musk Ox – and its creature powers to find it.